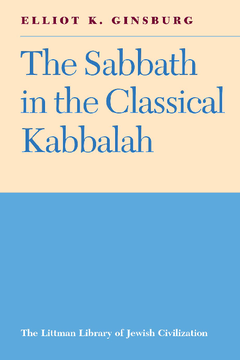 This now classic study is concerned with the richly imagined world of kabbalistic myth concerning the sabbath as it developed from the late twelfth century to the early sixteenth century and with its activation in religious life via ritual. The book opens with a historical overview of classical kabbalah, an outline of its symbolic universe. Special attention is given to the key mythic motifs that underlie sabbath observance: the sabbath as source of cosmic blessing; the sabbath as perfected time; the drama of divine restoration and sacred marriage; and the drama of human transformation by the sabbath as reflected in the motif of the sabbath-soul. This is followed by a theoretical discussion of the function and meaning of kabbalistic ritual and the problems of its interpretation. Theory gives way to practice with the close study of dramatic rituals located on the margins of the sabbath: the ritual of preparation—how one enters the sabbath—and the ritual of separation—how one leaves the sabbath and yet takes it into the week. Brief appendices deal with the special issues of Torah study and sexuality related to sabbath observance. The book also demonstrates how many of the influential practices associated with Safed kabbalah were actually anticipated by earlier mystics. The Sabbath in the Classical Kabbalah combines the close textual readings of traditional scholarly enquiry with more innovative approaches drawing on symbolic anthropology and the like. The presentation is coherent, cohesive, and accessible. It makes a contribution to the history of Jewish spirituality and, more broadly, to the understanding of myth and ritual. Elliot K. Ginsburg is Associate Professor of Jewish Thought at the University of Michigan at Ann Arbor, prior to which he taught at Oberlin College, and also served as Director of its Judaic Studies Program. He is the author of 'Sod Ha-Shabbat: The Mystery of the Sabbath' (1989), a translated and annotated edition of a work by R. Me’ir ibn Gabbai.